"Do not be afraid; I am the first and the last." Delivered from this mortal coil"
Azrael, The Angel of Death, existed for many years as human kind began to slowly thrive. However, a disturbance soon made itself clear. A woman with mysterious powers was reeking havoc upon the Earth, reducing the world to dust. Azrael confronted the woman, named Suphlatus, and questioned, " Why?" Suphlatus looked at Azrael, wary but not afraid, and responded, "Why not?" The ageless wisdom of Suphlatus was something to be admired. Azrael, understanding her powers to be a sign, requested that Suphlatus join him. Suphlatus agreed and became The Angel of Dust. Suphlatus and Azrael coexisted for many, many years concerning themselves with the general affairs of humans. Suphlatus, however, soon became wary of the humans. They lived and thrived and little was turned to dust. Little could be controlled... Suphlatus began to exert more power upon the humans, causing droughts and famines until they recognized her much like they recognized Azrael. They, of course, were two parts of the same whole: death. The humans recognized Suphlatus, having forgotten that she was once of their kind, and began to pay homage to her. Soon, humans began to fear death. It turned their blood cold, their hearts to iron. Fear turned to pain and pain to anger. Another powerful, human appeared and he was called Af. He was responsible for many deaths. Azrael, much like before, came to Af and questioned, " Why?" Af looked at Azrael, enraged, and responded, "Because it is not enough." Azrael, again, understood that Af's powers were a sign and requested that Af join him and Suphlatus. Af agreed and became The Angel of Anger. "Fear me, for I am pain manifested." Humans began to destroy themselves because of anger. Af relished in his influence and the bloodshed. Suphlatus also enjoyed the spectacle. It had been such a long time since she had been near death and bloodshed. Suphlatus began to resent Azrael and in the interest of revenge, Suphlatus united with Af and had a child. The child grew and thrived under the direction of Suphlatus until he had aged to an appropriate level. The child was named Simikiel and one day Azrael came to him and asked, " Why?" Simikiel said nothing for a long moment before responding, "Because there is both good and evil." Simikiel, finally, joined the ranks of the others and became The Angel of Vengeance. "Be warned for vengeance carries a double edged sword." Countless years passed. The four Angels coexisted and found their particular niches in relation to one another and in relation to humankind. Suphlatus, Af, and Simikiel believed that no other disturbances would come;Azrael knew better. Within the blackness of humankind another Angel arose and Azrael met with him. His name was Raziel and Azrael asked, " Why?" With a rose in hand Raziel sent his piercing gaze toward Azrael and smirked, "Because this is only the beginning." 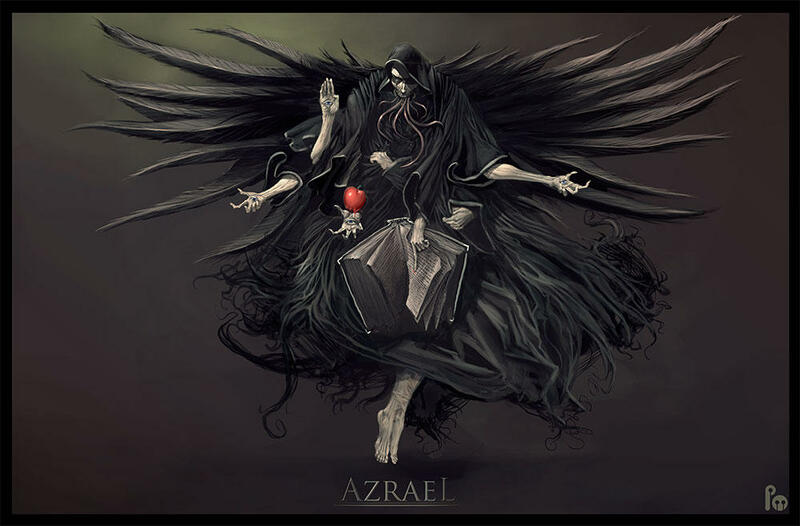 Azrael valued his wisdom and understood that Raziel would be the last of their kind for many years. Azrael extended his call and Raziel answered it, becoming The Angel of Mysteries. Raziel is regarded as the last of the Angels. Beyond this main tale of the creation of the Angels, the Tankoubon also reviews each of the Angels in detail and their relation to the Nyuusui. It is said that the five Angels selected a few humans from the Nyuusui and taught them their ways. From this initial separation the five sects of the Nyuusui developed. The Nyuusui, currently, have their main village of residence within The Fire Country. The Nyuusui then branch out to the other shinobi villages to pledge their strength. The Nyuusui, however, maintain ultimate allegiance to their clan village. The Nyuusui have maintained their power and will continue to do so for many years to come. Yet, this is a Tale Spoke withing the Onoda Clan, this leading people to believe the Nyuusui and Onoda are from the Same Branch. The Nyuusui are adept at using Ekton - Liquids. While their main abilities surround controlling already present liquid, Nyuusui members also fair very well with producing liquids of all natures. Nyuusui members are known for their incredible efficiency and their sometimes strange personalities. The Nyuusui members are also known for maintaining their own small village composed entirely of clan members. The Nyuusui write off their services to all of the major villages, but their main loyalty is always to their own kind. The Ekiryougan is a powerful Doujutsu with multiple applications. The first, and foremost, can be referred to as the ability to see usable liquid. For example, the human body possesses many liquids, all varied, and the Ekiryougan could divide these fluids into two groups: those that can be controlled and those that cannot. Most liquids that cannot be controlled are simply held too deep within an object. The Ekiryougan usually only allows for the first level of fluids to be manipulated. A shinobi that slowly gains mastery of the Ekiryougan is simply granted the ability to greater affect the first levels of liquid. For example, if a pot was filled with water and placed within that pot was another pot filled with water, the clan member would only be able to manipulate that first layer of water. This, of course, is most a safety measure. The Ekiryougan is very powerful, as the foundation of life is water, and it is very easily for younger Nyuusuimembers to become overloaded. The separation between the levels of the power of the eye are an evolutionary safeguard and a very important one at that. Liquids or fluids that can be controlled will be labeled as white in a Nyuusui's immediate vision. Liquids or fluids that cannot be controlled are labeled as black in a Nyuusui's immediate vision. However, the Nyuusui do not only detect liquid by sight alone with the Ekiryougan. The Doujutsu also allows the Nyuusui member to sense all the liquid or fluid within an area. However, liquid or fluid that is only sensed but not seen cannot be manipulated. A Nyuusui member must look at an object, discern the usable and unusable liquid, and then cast their preferred technique. Again, this is a safeguard. Attempting to manipulate a liquid or fluid without first discerning between usable and unusable liquid can cause a Nyuusui member to waste massive amounts of chakra and to greatly diminish their ability to use Ekton - Liquid techniques. The secondary ability of the Ekiryougan is the ability to switch views within a set range. Within our three-dimensional world we have three planes of existence: width, height, and depth. In a coordinate plane these are labeled X, Y, and Z respectively. A Nyuusui member can view the battlefield from any location within the coordinate plane within the accepted range of their Doujutsu. However, this is not to be misconstrued as three-hundred-sixty degree vision. A Nyuusui member can only view a battlefield from one single view at any one given moment. It should be noted that the more often a Nyuusui member switches between views, the greater stress upon the user. While the number of switches can be unlimited, most Genin cannot switch between views more than three times per post. The secondary ability of the Ekiryougan was built from years of older members using the Kinsei Ekiryougan with mediocre results. With only one few of the battlefield, a Nyuusui member can only pull liquids from what they can see in their immediate vision. Precious chakra is often wasted in this matter and Nyuusui members did have a tendency to tire quickly. The secondary ability was formulated and mastered in order to spur efficiency unforseen in earlier years of the Nyuusui. By switching views a Nyuusui member can accurately identify the best place to otherwise obtain control of a fluid. In this manner, the Nyuusui are some of the most efficient chakra users on the continent. This ability gains far more power and importance as a Nyuusui member grows and learns. The secondary ability of the Ekiryougan also factors into increasing the scope and range of a Nyuusui member's power. The Ekiryougan was and is able to sense all liquid within a set range. However, the only way to obtain control of that liquid was to turn and actually look at it. The secondary ability of the Ekiryougan was additionally formulated and mastered in the name of efficiency. A Nyuusui member with the secondary ability could now sense a liquid, switch views, and then could control that liquid as they saw fit. The Nyuusui member could essentially control liquids behind themselves without ever turning in that direction. The efficiency of the Nyuusui increased once again with the introduction of the secondary ability. The third, and final, ability of the Ekiryougan is often labeled as integration. All Nyuusui are innately connected and, as such, they can integrate their powers to increase their scope and range. Upon the activation of the Ekiryougan by both parties, the use of their Doujutsu can include extending the range of the secondary ability. A Nyuusui member may change their view from either their central position or the position of their opponent/ally. It should be noted that integration can happen with or without the permission of both parties, which can leave this as a very interesting ability when Nyuusui members are fighting against one another. The ability of integration is also useful for more powerful members as they can tap into nearby Nyuusui to increase their range. For this reason, the Nyuusui village is often never attacked. It would, of course, be a useless battle. Additionally, the third ability can be used with Yuuki Ayatsuri [Organic Puppetry]. When using Yuuki Ayatsuri [Organic Puppetry] only the corpses of Nyuusui members are processed. Therefore, integration can also be used when a corpse is being controlled. The Kinsei Ekiryougan is a powerful Doujutsu, which is a direct advancement of the Ekiryougan. The Kinsei Ekiryougan is usually achieve by Chuunin+ Nyuusui members. Currently, there are two recorded ways of obtaining the Kinsei Ekiryougan. The first way of obtaining the Kinsei Ekiryougan, often abbreviated as simply "Kinsei", is through advanced training methods developed by Nyuusui elders. In most cases the training involves pushing the body of the Nyuusui child to it's absolute limits. The Nyuusui have sometimes been criticized for their training methods, but they have no intention of changing their hard set ways. The advanced training often varies from person to person, but most often a child must fight wave after wave of organic puppets day after day until they obtain the Kinsei. Some Nyuusui members never obtain the Kinsei through the training, but in most cases this training method provides acceptable results. The secondary method of obtaining the Kinsei is often reserved for the most talented Nyuusui members, though less skilled members can request to follow the secondary path. The secondary method involves, first and foremost, a physical. The Nyuusui member, once they are determined fit, are checked into the hospital and then brought into a small completely white room. The Nyuusui member is given an IV and then put into a trance with a qualified Nyuusui physician. The Nyuusui member when in the trance is said to visit the leader of their particular sect [Azrael, Suphlatus, Af, Simikiel, or Raziel]. The meeting is different from person to person and can last anywhere from five days to one month, though far shorter and far longer times have been recorded. Generally, the faster the member returns from the trance and thusly gains the Kinsei the more powerful they are said to be. Now, this is not necessarily true, but legend is legend. The secondary method of obtaining the Kinsei is not often used because severe medical issues and death can sometimes, and often does, result. This, of course, is one of the reasons on the most talented members of the Nyuusui are given the option. A Kinsei brought about from the secondary training method usually develops faster and more powerfully than the primary method, but both most often even out around Jounin. A Nyuusui member that dies during this process almost always dies of an aneurysm, though heart attacks and other blood-related issues have also been recorded. It is said that the meeting with one of The Angels can be too trying for some bodies and they will suffer as a result. A Nyuusui member who suffers a complication during this process will not even be attempted to be saved. A Nyuusui member either walks into one of the rooms and walks out or they don't. All corpses obtained from the secondary method are salvaged and used as training devices for Yuuki Ayatsuri [Organic Puppetry]. However, all recent bodies are preserved and only bodies from previous generations are used. This preserving process is important so that same generation members are not forced to use friends, family, or acquaintances during training. A more in depth description of Yuuki Ayatsuri [Organic Puppetry] can be found below. The first, and foremost, ability of the Kinsei can be referred to as the ability to see all liquids. The Kinsei, unlike the Ekiryougan, can see all liquids on the battlefield. The Kinsei is not limited by depth. Fluids within the Nyuusui's immediate vision are labeled from white to gray to black hues. The closer a fluid is to the surface, the whiter it will appear. The deeper the depth of a fluid, the blacker it will appear. As it is implied, the whiter a fluid appears the lower the chakra cost for a Nyuusui member to obtain control of that liquid. The Doujutsu also allows the Nyuusui member to sense all the liquid or fluid within an area. Additionally, much like before, liquid or fluid that is only sensed but not seen cannot be manipulated. The secondary ability of the Kinsei is the ability to switch views within a set range. Within our three-dimensional world we have three planes of existence: width, height, and depth. In a coordinate plane these are labeled X, Y, and Z respectively. A Nyuusui member can view the battlefield from any location within the coordinate plane within the accepted range of their Doujutsu. However, this is not to be misconstrued as three-hundred-sixty degree vision. A Chuunin Nyuusui member can view a battlefield from three different views at any one given moment. A Jounin Nyuusui member can view a battlefield from five different views at any one given moment. It should be noted that the more often a Nyuusui member switches between views, the greater stress upon the user. While the number of switches can be unlimited, most Chuunin cannot switch between views more than five times per post and most Jounin cannot switch between views more than seven times per post. Yuuki Ayatsuri [Organic Puppetry] is considered the most cultivated ability of the Nyuusui. Stemming from the particular abilities of their Doujutsu, specifically their integration ability, Yuuki Ayatsuri [Organic Puppetry] has been heavily developed in past and recent years. The main facet of the ability is that all puppets are taken from the corpses of other clan members, as otherwise the integration ability would be fairly useless. All Nyuusui members are shinobi and, therefore, all Nyuusui members are driven to awaken their Doujutsu to further levels. Corpses do not necessarily need to be in pristine condition in order to turn them into puppets. As long as the brain and heart are intact, everything else can be fairly damaged. As Yuuki Ayatsuri [Organic Puppetry] has a foundation in medical techniques, most Nyuusui do have some medical jutsu in their arsenal and many move on to become Med-nin. Puppets will be taken from any Nyuusui member fifteen to thirty-years of age. The older and younger corpses will be stripped of their water and their various other components recycled. The process of producing an organic puppet is actually very ritualistic, with Nyuusui members often expending much energy for the process. Once a body is collected it is healed of all ailments and then taken to a unique chamber. A Nyuusui member that will be accepting the puppet will be put into a drug-induced coma. The body of the Nyuusui member will then be placed next to the corpse. From their the Nyuusui member will be given a certain drug that will continually force the member to leak chakra in high amounts. A special seal will be placed on the corpse to allow it to absorb the chakra of the Nyuusui member leaking it. The process usually takes forty-eight hours, after which the Nyuusui member will be awoken. From this moment forward, the Nyuusui member that gave their chakra to the puppet will be able to control it through the use of Ekton - Liquid manipulation. The corpse is kept usable by the chakra that the Nyuusui member will pour into it about once a week. The ultimate result is a puppet the can expand the users range and can be manipulated without the use of chakra strings. Puppets will often be augmented with armor and various other devices, though most puppets will not have their parts replaced with normal puppet parts. The reason being that the less liquid within a corpse, the more difficult it is to control. Though, as it should be mentioned, because the puppet will have the user's chakra running through it's veins it can launch techniques at the command of the user. It should be noted, however, that the more chakra that is expended within the puppet, the less amount of time it will be able to be used in combat. For most purposes, a Nyuusui member can control as many puppets at they are willing to. However, there are common thresholds that most Nyuusui simply abide by. Genin will usually have anywhere from three to five puppets. Chuunin will have anywhere from seven to ten puppets. Jounin will have anywhere from twelve to fifteen puppets. S-Ranked//Kage level shinobi will have seventeen or more puppets. These puppets can all be controlled at once, though this is often very difficult for a Nyuusui member. By age five, most Nyuusui members will have obtained their Doujutsu. Nyuusui members will be heavily trained by their parents and relatives before attending the Academy on the eve of their sixth birthday. The Nyuusui Academy runs year-round, as to always be able to accept and train new Nyuusui members. Nyuusui members will learn all about their clan in their first year at the Academy. Training is usually reserved for later years when their bodies are fully developed. However, training the mind is always started early and quickly. There are no Nyuusui members that do not attend the Academy. It simply does not happen and, as it should be noted, it never will. At age seven, all Nyuusui Academy members will undergo the personality test in order to match them up with their specific Angel and organize them into their particular sect. All sects are regarded fairly equal in power and prestige, though their may be some arguing between younger members about which is best. The personality test encompasses a question session and a written portion. The written portion is given first where a Nyuusui member will be given a series of moral and ethical questions that must be answered to the best of their ability. Leaving questions blank are allowed. After the written portion, a Nyuusui child will be put into a room where another Nyuusui member will ask them a series of questions. Sometimes the questions are conversational and sometimes they deal with very series issues like love, death, life, etc. A Nyuusui child will be questioned by three different members and separately. The process usually takes about three hours. After all the Nyuusui members of an appropriate age undergo a test, the Council of Personalities will decide which Angel and sect each child fits best with. The Nyuusui members in the Council of Personalities are unique because when they took their test it was decided that they did not fit into any sect or they fit into all sects. When this occurs the young child is trained to later join the Council of Personalities. The Council of Personalities is completed unbiased as to make certain that the absolute best sect is chosen for each child. The Council of Personalities will announce their results at a ceremony and then each child is given their Angel and sect. At this time, the child is allowed to spend two additional months with their family before the must spend two full years in a sort of secondary village away from home. The secondary village, often called "Paradise" as a play on words that these children will be attending an angelic world, is located about twenty-five miles away from the main village. A Nyuusui member in Paradise will be taught all about their sect and the deviations that may occur within it. In nearly every case, a Nyuusui member will align completely with their sect or they will be a complete opposite of their sect. Both occur and further details about personality definitions can be found below. A Nyuusui member will complete their training at Paradise and at age nine they are allowed to return home. A Nyuusui member will be allowed to obtain their first organic puppet upon returning home after attending Paradise. From this moment forward they may apply for more puppets as often as they like. However, it should be noted that a Nyuusui member must wait one month before they can apply for another organic puppet after receiving one. At age nine a Nyuusui member will be brought before the Council of Angels to be asked what they will do in the future. It is during this time that a Nyuusui member may decide to pledge themselves to one of the main shinobi villages or stay at home. A Nyuusui member will be brought before the Council of Angels before their tenth birthday. On their ten birthday they will follow through with their decision and either leave or stay. A Nyuusui member will again be asked if they wish to leave or stay near their twelfth birthday. After their twelfth birthday, a Nyuusui member must ask for an audience with the Council of Angels in order to pledge themselves to one of the main villages. All Nyuusui members are considered adults at age fifteen. Class A - 1000+ members. The entire Nyuusui clan is separated into five sects that are based off each of the five Angels that are the foundation of the clan. The five Angels are Azrael, Suphlatus, Af, Simikiel, and Raziel. Each of the sects has specific personality traits that develop within Nyuusui clan members that eventually function into everything they do and think. A Nyuusui member will be loyal to their sect through and through and will often pay homage to their particular Angel. A Nyuusui member's highest aspiration is to become the leader of their particular sect, an Angel, and function in the Council of Angels. Those members that are not part of the sect are taught to become one in the Council of Personalities, a complete neutral group within the Nyuusui. Each of the sects have two main personality types: those that follow the personality of their Angel exactly and those who are the complete opposite. All Nyuusui will fall into one of these two groups, thought often no spoken distinction is made between them. Each of the sects are described below. The first group of the Azrael Sect [often called the Az Sect] are traditionally the most intelligent members in the entire clan. The first group in the Az Sect tend to be aloof and often do not connect well with their peers. Those in the first group often find refuge in the arts or other creative avenues that may or may not suit the shinobi lifestyle. Those in the first group do not fear death, but do fear not being known. Often their greatest aspiration in life is to be noticed and remembered for ages to come. The first group of the Az Sect are often strategists and planners. They do not throw themselves in battle and will reserve themselves for the perfect moment to strike. Those in the first group are traditionally very patient and very moral. They also have an incredibly memory and have a talent for writing. The second group of the Az Sect are traditionally the least intelligent members of the clan. The second group tend to be very socially oriented and will usually do very well among their peers. Those in the second group will often be very average in all aspects, save for their ability to produce friends and allies. They are traditionally not hyper-intelligent or hyper-aware and will often battle more with their hearts than their heads. Much like their first group counterparts, those in the second group are also very moral, but in a different matter. Those in the second group do not fear death, but mostly because they are hard-headed. Those in the second group are often very brash and also aspire to be remembered for ages to come. They also have an incredibly memory and have a talent for the content of their writing, thought not necessarily their handwriting. The first group of the Suphlatus Sect [often called the Su Sect] are traditionally the most disagreeable members in the entire clan. The first group of the Su Sect realize that their true form is dust and therefore detest life and the crude understanding that other humans have seemed to grasp of it. The first group also find great comfort in death and regard it as the greatest and most honorable gift after a fierce battle. Those of the first group of the Su Sect will never, ever, never give up. Ever. Their fierce determination, almost to the point of fault, is renowned within the Nyuusui clan. Those of the first group of the Su Sect believe in themselves and Suphlatus above all else and will never doubt themselves or their angel. The second group of the Su Sect are traditionally the most playful and loving of all the members of the clan. They are traditionally female, thought this is not always true. The second group of the Su Sect love life as they realize their is an end. They attempt to enjoy every moment of their time on earth and do not let anything prevent them from this. Those in the Su Sect have a defined respect for the earth and life, as it was all created from one central thing: dust. Those in the Su Sect are often very intuitive fighters, who go with the flow more than they plan or just fake it until they make it. Those in the Su Sect do not fear death as it is inevitable, though they do fear pointless destruction. The first group of the Af Sect are traditionally the most hot-tempered members of the entire clan. The first group thrive on anger within themselves and within others; they nearly feed off of it. Those in the Af Sect regard anger as the greatest of all emotions. It shows ones true colors and never lies. It brings out the deepest portions of the human soul to the surface so that it might be seen. Those of the Af Sect will often try to anger everyone around them in order to give them a learning experience. Those in the Af Sect merely wish to show others their true selves so they might live fuller and truer lives. Those within the Af Sect often have incredible strength and force of will. The second group of the Af Sect are traditionally the most patient of all of the members of the entire clan. They view anger as incredibly powerful and therefore incredibly dangerous. "Anger corrupts and absolute anger corrupts absolutely," is a long used adage of those of the second group of the Af Sect. The second group of the Af Sect have a tendency to be very quiet and well-mannered. They tend to avoid conflict to avoid aggravating their temper. It should be noted that if those of the second group of the Af Sect become angry, their anger is often stronger than that of even the first group. Those within the Af Sect often have incredible strength and force of will. The first group of the Simikiel Sect [often called the Sim Sect] are traditionally the most cunning of the entire clan. Those of the first group of the Sim Sect have minds tailored toward plotting and planning. They often make very good strategists because of this fact. Those of the first group of the Sim Sect also tend to live the longest out of the entire clan. Their ability to think quickly on their feet in order to survive makes them incredibly useful in battle one-on-one but they can cause problems in groups. Those of the first group of the Sim Sect usually only look out for themselves and their survival. The only act in the interest of others and the clan as a whole if it in their interest and/or not a detriment to them. Those of the first group of the Sim Sect regard themselves as the most important and are also often vain. Those within the first group of the Sim Sect are often skilled warriors. The second group of the Sim Sect are traditionally the most prideful of the entire clan. They are also traditionally the least cunning and they will take things at face value and often have trouble distinguishing nuances and subtleties. However, one must be warned because if those of the second group of the Sim Sect are crossed they are incredibly vengeful. They refuse to have anyone or anything tear them down or underestimate them. Because of this mindset those of the second group of the Sim Sect are often jacks of all trades and masters of none. In other words, they are great at many things but they are not masters at anything. Those within the second group of the Sim Sect are often incredibly skilled warriors. The first group of the Raziel Sect [often called the Ra Sect] are incredibly crafty. The first group of the Ra Sect are often very good actors and artists. Those of the first group of the Ra Sect are excellent at making traps and are often incredibly good with weapons. Those of the first group enjoy solving puzzles and mysteries and concern themselves heavily with the culture of the Nyuusui over the shinobi aspect of their clan. Those of the first group are often smaller, more agile, and very fast. Those of the first group of the Ra Sect are also skilled with weaponry. The second group of the Ra Sect are incredibly crafty. The second group of the Ra Sect are often very good scientists and engineers. Those from the second group of the Ra Sect are largely responsible for the daily happenings within the clan [commerce, paperwork, etc]. Those of the first group of the Ra Sect are sometimes referred to as the lifeblood of the clan. Though never particularly brilliant in one area or another, they represent the main force of the Nyuusui. Those of the first group of the Ra Sect are often very friendly, amiable, and ready to work. They are often very patriotic and are very loyal in nature. Those within the first group of the Ra Sect are often the most average and make skilled sensei. Eh, no one cares except me so I'll save this until later. The Nyuusui Clan live within a sovereign shinobi village composed entirely of their own kind. As such, Nyuusui members are jacks of all trades. Whatever various positions need to be filled within the village a clan member will step up. The Nyuusui Clan is composed of many, many professions and, as such, they are largely autonomous and do not need to rely on the larger shinobi villages for goods or assistance. - PM to join, yo.